Here’s another crowd pleaser perfect as an appetizer, for tailgating, or for dessert paired with Wine. Often referred to as “Millionaire Bacon” in restaurants, you can easily experiment by using your own preferred seasonings. For prep you can do this in the oven on a raised rack, but we prefer the grill, cooked indirect. Separate strips of bacon on a raised cookie sheet. Blend Dizzy Pig seasoning and brown sugar with a whisk. Coat both sides of each strip of bacon with a thin, even coating of your mixture. 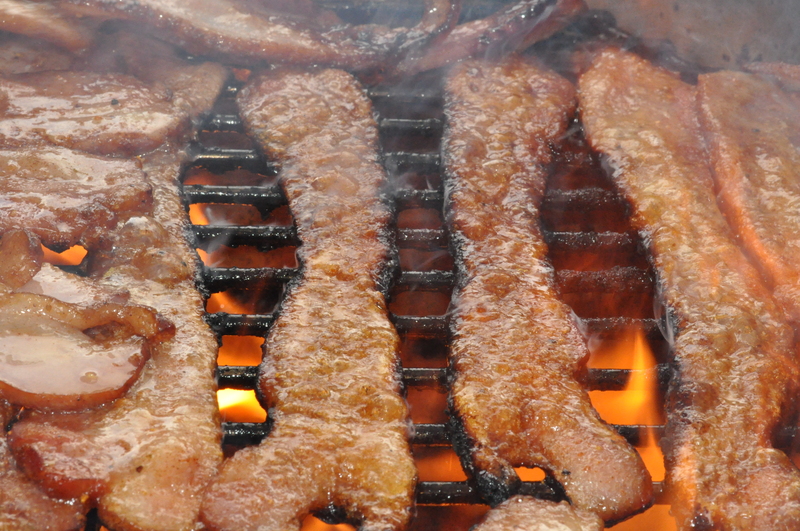 Transfer bacon to a raised rack on a cookie sheet or directly to the preheated grill. For easier cleanup, put aluminum foil on bottom of cookie sheet or plate setter/eggvector if cooking on a Big Green Egg. Set aside and allow to mostly cool. Cut into bite-sized pieces with scissors for a party or eat by the strip!